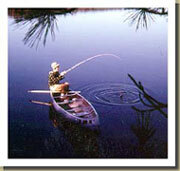 Canoe Country Outfitters a BWCA BWCAW Quetico Canoe Outfitter is offering canoe, camping, and fishing trips to the Boundary Waters Canoe Area of N.E. Minnesota and Quetico Park of Canada and has done so for over 70 years. This vast wilderness lake region, known also as the Border Waters, encompasses over 2 million acres and is void of roads, resorts, and private cabins. The entire area is for canoes only, except a half dozen BWCA lakes that still allow limited use of motorboats. The BWCA-Quetico Wilderness has remained unchanged through the centuries. Paddle and portage from lake-to-lake and explore the same routes that the Chippewa Indians and French-Canadian Voyageurs traveled years ago. Hear the echoing call of the loon, the splash of a beaver tail, the howling of wolves, the sound of a paddle as it rhythmically dips into the water. Photograph wildlife that includes moose, deer, bald eagles, beaver, otter, and loons. Fish for walleye, northern pike, lake trout, and scrappy small mouth bass. As you sit at your campfire, turning crisp fish fillets in the fry pan, you realize that you’re in the midst of a virtual fisherman’s paradise. Canoe Country Outfitters is conveniently located in downtown Ely, plus we maintain a private canoe base on Moose Lake (20 miles east of Ely). From these two locations we are able to quickly service all area trip starting points. We have outfitted more people and have been under the same family management longer than any other outfitter, so no one can match our experience and knowledge of the area. Entry permits are required to travel through this area and we’ll make the application in your behalf. These permits are very limited, so early planning is a must. A colored brochure, rates, and free map will be sent upon request. We look forward to assisting you in setting up a trip!